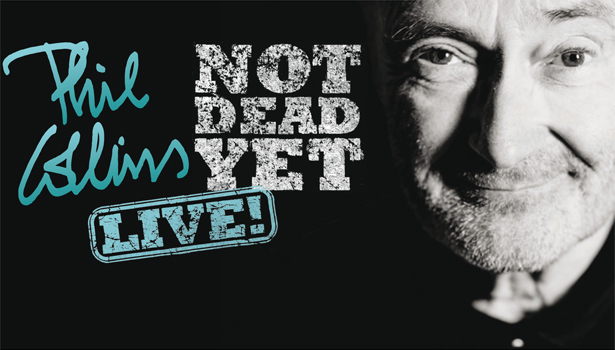 With his first ever solo concert in Brazil, Phil Collins has kicked off the third leg of his "Not Dead Yet - Live! Tour" last Thursday evening. Meanwhile this selection of show can be refered to as a proper world tour, even though it's still not sure whether (and if so, where) it might be continued after the current run of shows. On Thursday night, Phil opened the Latin American leg of his tour named after his autobiography at Rio de Janeiro's Estádio Jornalista Mário Filho, commonly known as Maracanã, in front of a euphoric crowd of about 55,000 people. Apart from this being his first ever solo concert ever in Brazil, Collins has already played right next to this gigantic stadium - long time ago... It was back in May 1977, when Genesis' Wind And Wuthering Tour stopped at the Ginásio do Maracanãzinho, an indoor arena that is part of the stadium complex. Interestingly, fourty years ago it were exactly the same Brazilian cities on the Genesis tour schedule, that Phil Collins is currently visiting: Rio de Janerio, São Paulo and Porto Alegre. Before the main concert, The Pretenders with front woman Chrissie Hynde played almost a one hour set from 8 pm to 9 pm (local time). This band will also be supporting the whole rest of the current tour leg. After a break of 30 minutes, Phil Collins took the stage at about 9.30 pm. Compared to the last leg of indoor concerts, the setlist has been cut down to 100 minutes. This was about the same length we already know from last year's outdoor show in Dublin. The Hyde Park performance was shorter due to the festival character of the event. But why does it seem to be impossible to play for at least two hours like they did indoors? Those shows had an intermission, but even that should not be a problem as this was usual on every outdoor concert of 1994/95's Both Sides Tour. To cut the show down to 100 minutes, mainly slower and quieter songs such as One More Night, Can't Turn Back The Years and You Know What I Mean have been dropped. Maybe this was done to meet outdoor/stadium. However, this is a shame especially as the rediscovered You Know What I Mean used to be a highlight of last year's shows. On this one and I Don't Care Anymore, which has also been axed, young Nicholas Collins could show all of his great talent both behind the drums and at the piano. Apart from all shortenings there is at least one song, that has been added to the setlist. And it might be a real suprise to most of the fans: Throwing It All Away, a song which is predestined for stadium concerts and which has made crowds sing along to ever since it was released back in 1986. By the way, it was not the first time Phil has played this Genesis song on a solo performance. Back in December 2003 it was part of his short appearance on one of the first Little Dreams Foundation galas in Geneva and among others he was accompanied by Mike Rutherford. It might definitely be questioned if it is necessary to put a third Genesis song (in addition to Follow You Follow Me and Invisible Touch) on the setlist in order to get a Brazilian stadium crowd going. There should be adequate songs enough in Phil's own solo back catalogue for this purpose. Why not stick to e. g. Who Said I Would, that had been played on the last leg and missed the first Brazilian concerts? As usual Phil Collins finished his first concert in 2018 with Take Me Home, which can rather be considered as a standard than a proper encore. All the above mentioned criticsm beside, fans in Latin America are obviously extremely pleased and delighted to finally get an unexpected chance to see Phil Collins live in concert again. Ticket prices on European levels are a real downside of this tour leg, as people have to spend as much or even more than their avarage monthly income to see a show. But still it seems that tickets for the upcoming shows have sold really well or at least good enough to make the tour work. For Phil Collins it's the first time in 23 years to play in Latin America. For most of the cities and countries it's only his second visit after 1995, for some it's his first ever. Logistically even nowadays a tour like this is a challenge. This showed already before the first concert. On his way from the rehearsals in Miami to Brazil sax player George Shelby had to make an unintended detour via Houston, Texas to solve visa problems at the Brazilian consulate. According to press reports, after his arrival in Rio de Janeiro even Phil Collins himself had to stay a few hours longer than planned at the airport for the same reason. The tour will continue with another show in São Paulo tonight. After the following concert in Porto Alegre, band and crew will return to Miami for a couple of days off, mainly because Nicholas Collins has a few concerts to play with his own band What You Know in the Miami area. After that the tour will resume in Mexico. You find details on our tour dates page (see link at the bottom).